Manufacturer of a wide range of products which include falling film evaporator, agitated thin film evaporator, forced circulation evaporator, rising film evaporator, waste water evaporator and multi effect evaporator. The Falling Film Evaporator is specifically suited for processing temperature sensitive products with a low viscosity and tendency for fouling. evaporate. Agitated Thin Film Dryer is the ideal apparatus for continuous processing of concentrated material for drying. Agitated Thin Film Dryer is consist of cylindrical, vertical body with heating jacket and a rotor inside of the shell which is equipped with rows of pendulum blades all over the length of the dryer. The hinged blades spread the wet feed product in a thin film over the heated surface. A highly agitated bow wave is formed in front of the rotor blades. The turbulence increases as the product pass through the clearance before entering a calming zone situated behind the blades. As the heat will transfer from jacket to the main shell under the smooth agitation water/solvent will evaporate and liquid will convert to the slurry, to cake and to dry powder or flakes. He vapors produced rise upwards, counter-current to the liquid and passes through a Cyclone Separator mounted at the vapor outlet of Agitated Thin Film Dryer(ATFD). Further, these vapors will be condensed in a condenser and recovered as condensate.The system will be operated under vacuum for temperature sensitive products and atmospheric conditions for normal drying. Forced Circulation Evaporator for the concentration of high viscosity material and products with higher solids. 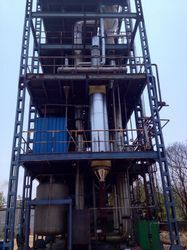 This is also used as evaporative crystallizer. To achieve desired concentration Falling Film Evaporator followed by Forced Circulation Evaporator is used to minimize the operating cost. 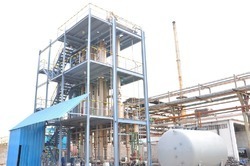 In this type of evaporator, the liquid is pumped through the tube side of Calandria at high velocity avoiding precipitation and fouling; the liquid is then passed through vapor separator for separation of vapor. Concentrated liquid is continuously discharged from the bottom of the vapor separator with the pump. High Recirculation is to be maintained inside the tubes by the recirculation pump. KEP is leading technology solution provided in the field of Wastewater Evaporator. Based on the Effluent characteristics KEP Experienced design engineer will select the type of evaporator. All the Evaporators manufactured by KEP is custom. Most of the order which we received by referral only. Major criteria for the design of Evaporator is Total Dissolved Solid(TDS) and Chemical oxygen demand (COD). For Low boiling Solvents, we provide the stripper column for removal of solvent before feeding to MEE system. 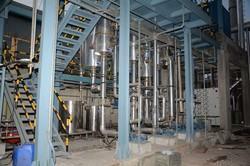 The operating cost of a Multi Effect Evaporator is largely determined by the energy consumption. The energy consumption of the system can be tailored to meet the customer's individual requirements by intelligent thermal configurations of the evaporation plant. Our Engineers always work on all possibilities to save energy by combining following unit operation.